The M842 is a compact, three phase power meter. It measures Volts, Amps, Frequency, Active Power, Apparent Power, Reactive Power, Active Energy, Reactive Energy, Power Factor, Amp Demand, Apparent Power Demand, Active Power Demand, Maximum Amp Demand, Maximum Apparent Power Demand, Maximum Active Power Demand, and THD on voltages and currents. Voltage and current measurements are true RMS. 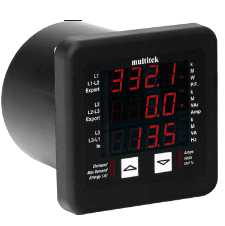 The MultiDigit is designed to be user friendly and simple to use. All operations, including programming, are performed by using the two push buttons on the front of the instrument. MultiDigit units are pre-programmed by the factory and no further programming is necessary. However, a user can reprogram most parameters in a MultiDigit e.g. nominal current and voltage inputs, relay output etc.